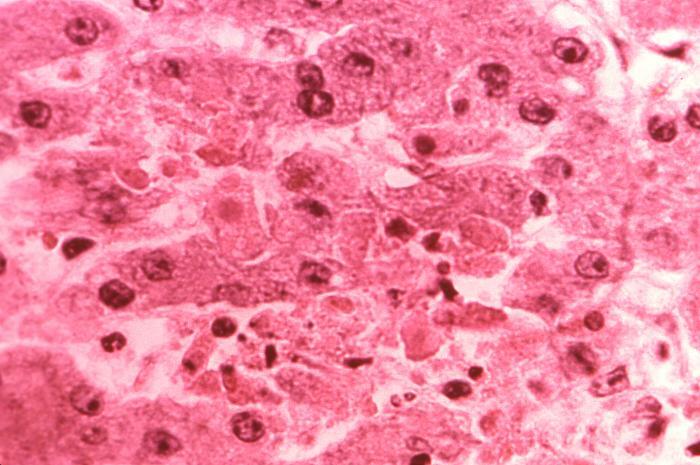 Under a magnification of 400X, this hematoxylin-eosin-stained (H&E) photomicrograph depicts the cytoarchitectural changes found in a liver tissue specimen extracted from a Lassa fever patient. Note the “zone of acidophilic necrosis, and numbers of pycnotic nuclei". From the booklet entitled, ”Yellow Fever: Positive and Differential Histopathology Diagnosis”, PHIL images 13001 through 13043 illustrate the findings encountered when performing a differential diagnoses comparing characteristics of liver cytoarchitecture in cases of yellow fever with viral hepatitis, Lassa fever, Marburg virus, Ebola virus, Dengue hemorrhagic fever, Congo-Crimean hemorrhagic fever, Rift Valley fever, and malnutrition. Copyright Restrictions: Yes - This image is copyright protected. Any public or private use of this image is subject to prevailing copyright laws.Please contact the content provider of this image for permission requests.